Tokyo's hot and humid summers present the perfect atmosphere for growing tomatoes, peppers, and a wide variety of vegetables. 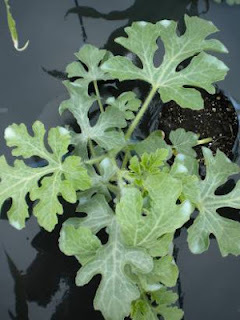 The trouble is, though, it is also the ideal atmosphere for powdery mildew. The bane of our farm and my garden, along with aphids, powdery mildew tends to attack the cucurbit crops without compunction. My first year on the farm we grew watermelons and squash, but powdery mildew settled in and essentially ruined both crops. Zucchini, thankfully, comes and goes so quickly that the spores don't have much time to attack it. Last year for the first time in years the farmers planted a tentative row of cucumbers to see what might happen. Beautifully trellised and tended, we reaped a very nice crop and they found enough inspiration to plant at least three rows this year. Two rows of squash have also been added to the mix, and so far blooms and young fruit alike look good. Milk drops on watermelon leaves. In my own garden, I opted for watermelon rather than squash this year. Watermelon is one of my favorite summer fruits ever, and while I enjoyed the squash of years past I really like watermelon. It's interplanted with sweet corn (another first for me) in a nod to the American triumvirate of corn, beans, and squash. The beans are just next door in the same row and happily blooming. So far, everyone looks good here, too. Then I remembered something that Michael Phillips wrote in The Holistic Orchard. He cited studies done in Australia and Brazil where milk sprayed on crops at a 10% solution effectively reduced the occurrence of powdery mildew. Phillips writes that calcium inhibits fungal spore germination, in this case Sphaerotheca fuliginea, while others suggest that the naturally occurring salts and fats in milk may also play a role in slowing the fungus' spread. Phillips recommends using whey, a by-product of the cheese-making process, which often comes free or nearly so, and like milk, is benign in the environment. Farmers in New Zealand reportedly used milk fresh from the cow, while others experimented with skim milk. Wagner Bettiol, the Brazilian scientist behind the research, used whey as well as milk in his experiments. 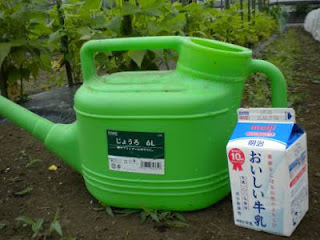 For my part, I used whole milk bought at the grocery store at something close to the recommended 10-percent solution in my watering can. A spray bottle would be ideal, but I decided to opt for the simplest solution at hand. It does mean the underside of the leaves was missed, but I'm hopeful that enough will be absorbed to make it worthwhile. This paired with good plant spacing and plans for future trimming to ensure air flow should help stave off disease problems over the course of the summer. Here's hoping for a watermelon rich summer! How is this working so far? I battle mildew constantly in my cool coastal neighborhood and have an abundance of whey since I started making cheese recently! Are you noticing that it is helping on your plants? The leaves of that watermelon plant are beautiful, by the way!